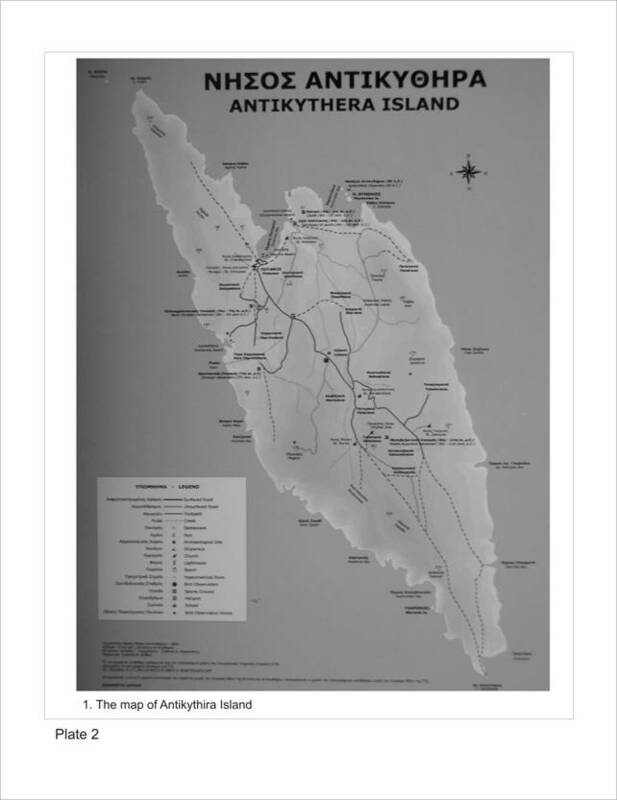 The Greek island of Antikythira (the island’s ancient name is Aigilea) lies in the south of Greece, half the distance between Kythira and Crete. This position provides the small island strategic importance because it is here that the sea currents from the Mediterranean and the Aegean seas meet. The modern trade sea routes connecting the Mediterranean and the Aegean pass south of the island even nowadays (Plate 1/ 1, 2). The geomorphology of the island is as follows: an alternation of earth, rocky soil and an area of large lime slabs. This is the reason why landslides occur here and one can see how the ancient lime layer is overlapped by lime slabs (Plate 3/ 3). There are rocky areas and small terraces where the agriculture is subsistent. The island has been inhabited since the Minoan era. Here several tombs have been found that date back to those times. No artifacts have been found dating from the classic period probably because the inhabitants left the island. It is as late as the Hellenistic period, more precisely the 4 th – 3 rd B.C., that we find here a fortress of the pirates of Aigilea who are economically and militarily connected to Crete (quite a few coins minted at Phalasarna, Hellenistic fortress in the north-west of Crete, have been discovered – for more info please refer to the article of Tina Martis, Michalis Zoitopoulos & Aris Tsaravopoulos, ANTIKYTHERA: THE EARLY HELLENISTIC CEMETERY OF A PIRATE’S TOWN). The pirate activity of the people on the island goes on until the 1 st century B.C. when Pompeius eliminates piracy in the Mediterranean (Plutarch, Pompeius, 24 - 30). As a result of the archeological excavations, it has been noted that there are no more artifacts dating after the end of the 1 st century B.C. The island is no longer inhabited until the 5 th century B.C. when the first elements of the Byzantine culture appear (we are speaking here about ceramics). After an approx. 400-year hiatus, the island is again inhabited starting the 5 th century (Plate 2). The proofs are the archeological discoveries that date from this period of time, in particular pottery (Plate 3 / 2, 3) and graves. The ceramic fragments found in these areas date between 5 th and 7 th centuries: most of the amphora fragments are LR2 amphora fragments (Peacock & Williams 1986, class 43), Late Roman “C” Ware, (Hayes 1972, shape 9, p. 365, fig. 78/68 m; Atlante I 1981, p. 232, tavola CXVII / 15 dated 520 - 600). 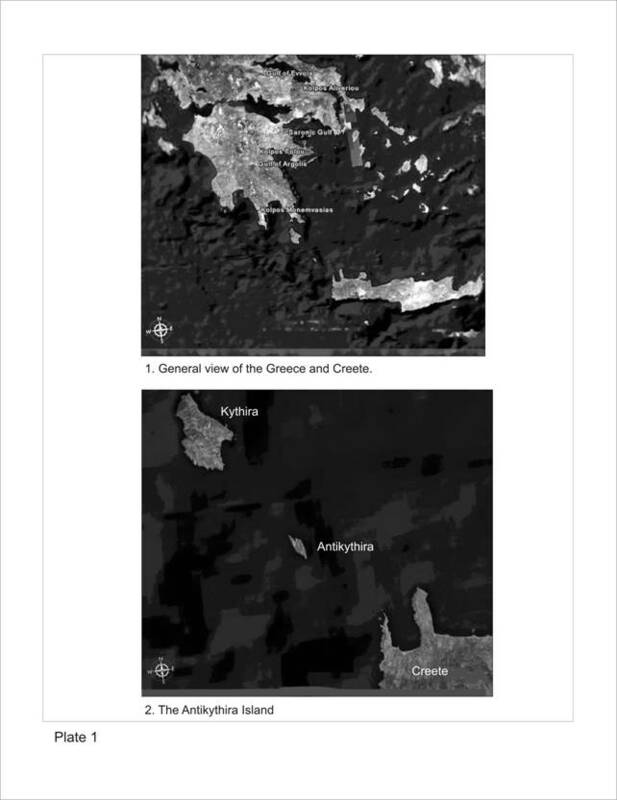 The settlement on the island in the 5 th century can be combined with the information concerning the migratory invasions in mainland Greece during these centuries. The island was seen as a place safe from these perils . Galaniana (at the St. Miron monastery a coin from the times of King Leon IV (775-780) was found, as well as many ceramic Early and Middle Byzantine fragments . Xiropotamos (it is here that the Hellenistic fortress is; in the Byzantine period very few Byzantine ceramic fragments are signaled in this extremely difficult and rocky area). 1. The people lived in homes with a wooden structure elevation, possibly with a stone “above the ground foundation”, that is why the wood disappeared while the stone was re-used in the modern period for making terraces on the island. 2. The people lived in huts, but none has been found so far. 3. They lived in the caves of the area which had been used as graves in the Minoan period. It remains to be looked into whether these elements of the Byzantine culture can also be found in caves. Despite the fact that at present there are 7 churches on the island, no Christian basilica has been discovered to date back to the Byzantine period. As at present the research is at an early stage it remains to be looked into first whether there was a basilica in the Galaniana area (our assumption that it is possible that the oldest Christian basilica may be here is based on the following arguments: there is the St. Miron monastery with the oldest modern church – it may be memoria loci, it is here that a coin from Leon’s IV times in the 8 th century was found, as well as the existence of a cave with water used in the church at present as well in the very vicinity of the monastery; we are hopeful that the future research will confirm or contradict this theory). 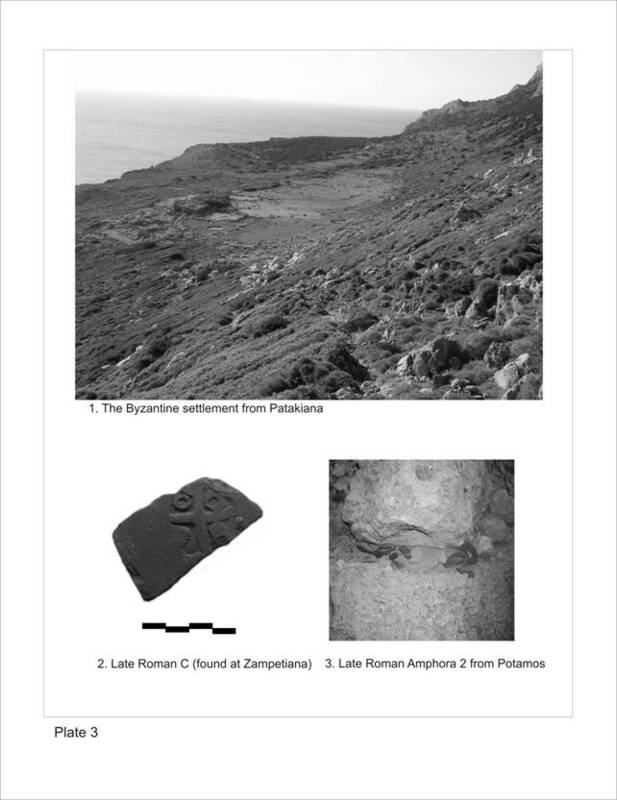 Up to the present day the graves in three more accessible areas have been excavated: Zampetiana, Harhaliana and Batoudiana in the centre of the island. Located in the north of the island, the first two areas are the richest as regards the 5 th – 7 th century Byzantine material and they are the places where most of the Byzantine graves have been signaled. This is why we believe that the most important 5 th – 7 th century settlements are here. The graves excavated so far in these areas are twelve. Five of them are in Zampetiana, and the remaining in Harhaliana. The highest density of ceramic fragments is in the Harhaliana area where over 10 graves have been localized so far, among which seven have been excavated. All graves are dug in stone and are east – west oriented. 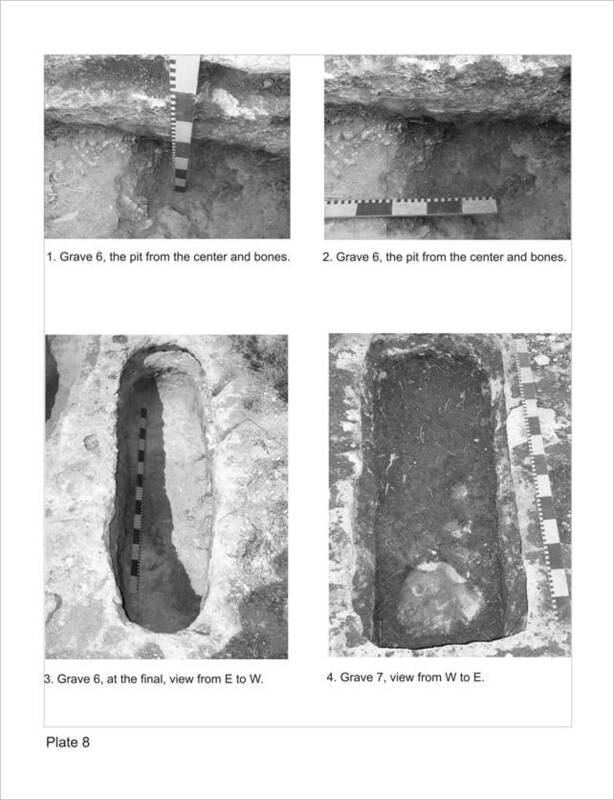 Among the seven graves excavated in Harhaliana bone fragments were found in only five of them, the other two had been emptied and used most likely as water tanks by the locals. o nly four graves were found untouched of the total of twelve excavated graves, with the stone slabs on top. with “patura”: a ditch at ground level which the stone slabs lean on (Plate 4 / 3). with niche, the slabs that seal the grave are placed on a niche, then fixed into position with mortar (Plate 4 / 4). Among the twelve excavated graves, the preparation of the grave bottom was noted in only one of them because during the digging of the grave a pit was made in the central area. In order to level the bottom of the pit, it was repaired with earth and pebbles (Plate 8 / 1, 2). In only ten of twelve graves bone fragments were found (in a grave excavated in 2005 only two skull pieces were found on the bottom of the grave, which makes us believe that the grave had been emptied at a certain moment, and it is difficult to say whether this had been done in the ancient days or at present). 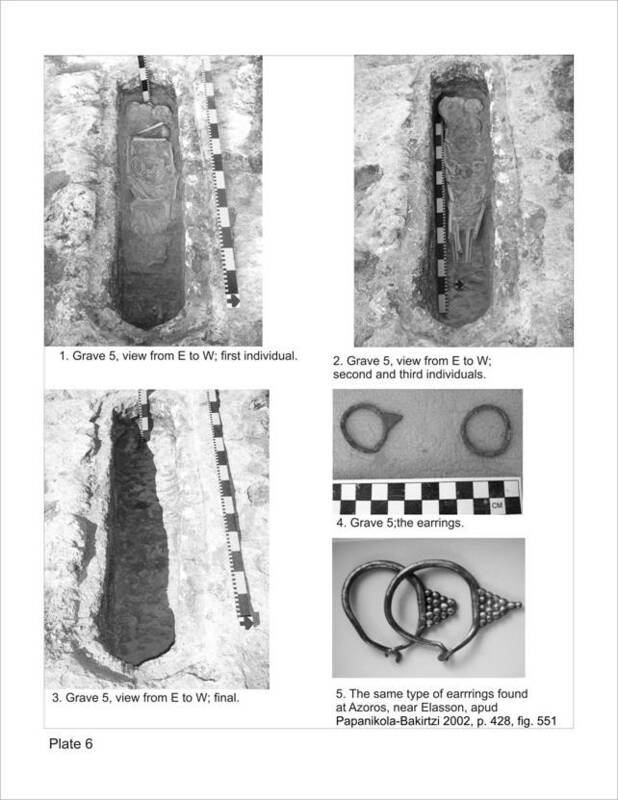 Further we will present only a few of the graves where human bone pieces were found. G1 (Plate 5 / 1): a child’s grave (according to the analysis of the teeth, the child is 5 - 7 years old), dug in 2000 by Dina Papathanasiou. 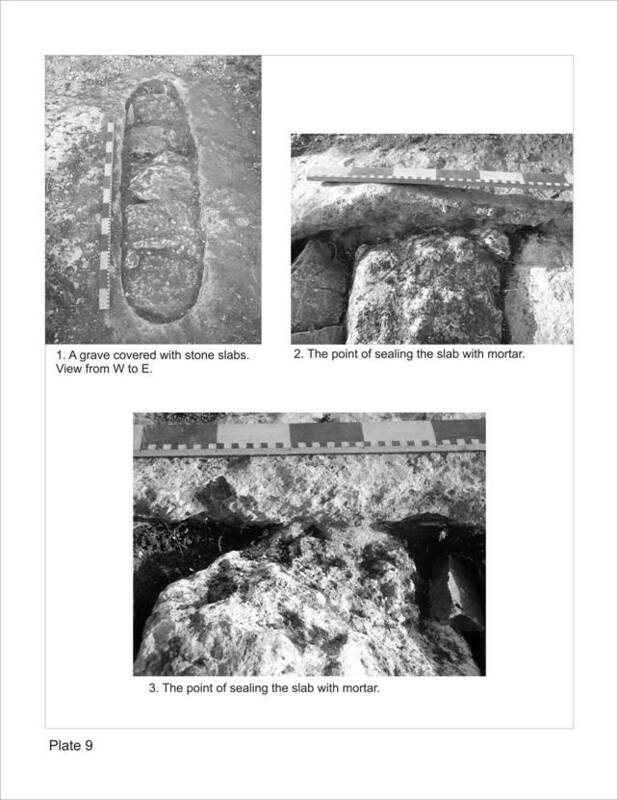 The grave is east-west oriented, head to the west, an oenochoe was placed at the child’s feet (Plate 5 / 3) (Marrou 1999, p. 112 and Dennis 2001, p. 7, on the custom of taking food for the “voyage beyond” and Velkovska 2001, p. 21 – 45 on the Byzantine funeral ritual according to liturgical sources). In the abdomen area, towards the left shoulder blade, a bronze cross-shaped buckle was found (Plate 5 / 2) (analogy to Travlos, Frantz 1965, plate 43 / a, dated the 6 th / 7 th centuries).The bones are anatomically connected, which is indicative of the fact that the grave was untouched. Comparing the inventory with the inventory of the graves in a Samos cemetery, the grave is dated in the 6 th / 7 th A.D. For the dating of the oenochoe at the beginning of the 7 th century, see Robinson 1959, p. 122, plate 35 / N2. In the summer of 2003, the archaeological excavations went on in the region. North of the house of the Beltecos family, a group of five stone dug graves was discovered. Three of them were still covered with their slabs, so they had not been emptied, while the last two, in the south, had already been tampered with and were full of vegetation. The covered ones had lime slabs and the gap between the slabs was filled with pebbles and ceramic pieces. Two types of graves were represented in this group as well: with niche and with « patura ». G2 (Plate 5/ 4) : this is the furthest north, two adult skeletons were found. They were preserved well enough even though disturbed at places. Examining their positions, it seems that the dead had been placed one on top of the other – the width of the grave is very limited. We cannot be certain whether the burials had been made at the same time or there lapsed some time between one and the other. G3 (Plate 5/ 5) : situated immediately south, smaller in size, it includes two children’s skeletons, placed one at the side of the other. Under their heads there was a stone used as a «pillow ». Their position is indicative of the fact that they had been buried together. The other three graves contained poorly preserved bones and the total lack of inventory proves the economic difficulties of the period and the poverty of the settlement. Other two graves were also excavated, situated south – west of the previous group. The first (G4) included a group of three people, buried together, while the second was differently covered, with no patura , with only three cuts along the long sides. The absence of inventory does not provide for the precise dating of the graves, but their vicinity with and typology similar to the graves dug in 2000 allow us to date them back to the same period of time (the second half of the 6 th century – early 7 th century). 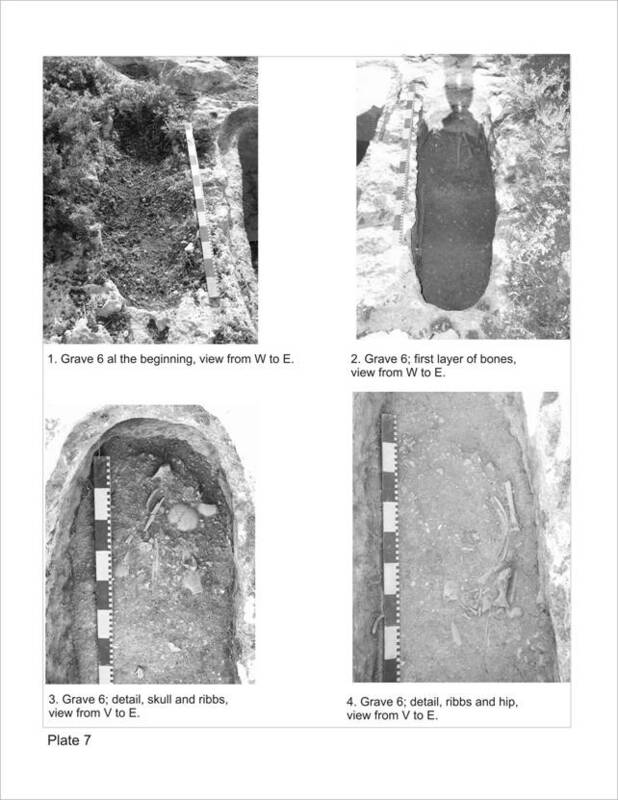 G5 (Plate 6 / 1 - 3) : this grave was dug in 2004, falls within type 2, with “patura”, contains three individuals placed one on top of the other. The bones are anatomically connected, with small exceptions at the feet area, but we believe that these interventions had been caused by roots, and not people. A moved mandible piece was found in the abdominal area possibly because of plant roots. After the removal of the first individual, it could be noted that the feet of the other two overlapped. We should mention the fact that the bones are very badly preserved and breakable at the slightest touch. The wear of the teeth indicates that these are adults over 30 years of age. One of the earrings is one open hoop terminating in a cylindrical eyelet. a granulated bunch of grapes is affixed to the lower part of one earring (analogy in Papanikola-Bakirtzi 2002, p. 428, fig. 551 dated in the 7 th century) (Plate 6/ 5). In 2005 we continued the excavation north of Harhaliana, in the same place where in 2004 we found grave 5 and where in the previous years Dina Papathanasiou had found a child’s grave. In this area another five graves were discovered. 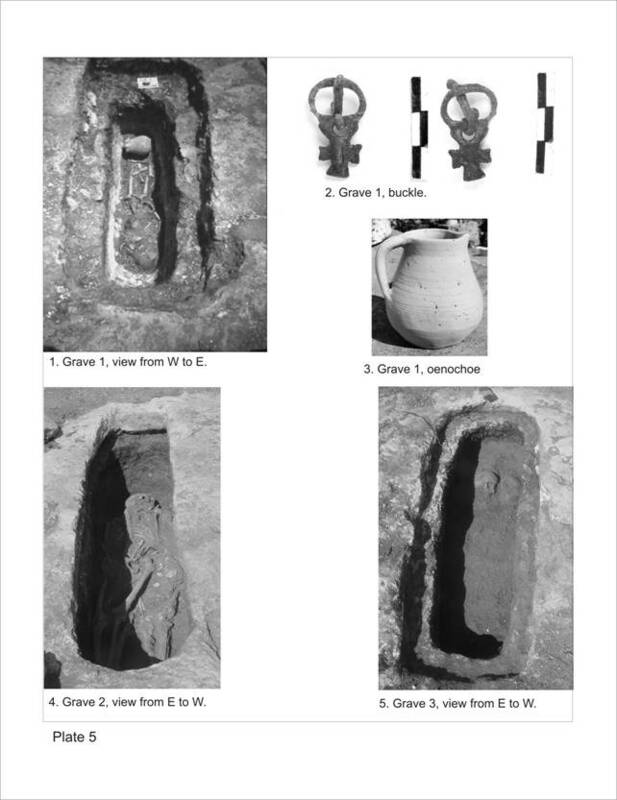 G6 (Plate 7/ 1 – 4; 8/ 1 - 3) : This is a grave with lateral niche for the covering stones (which were not found). At a 0.40 m depth we found the first human bones: 2 phalanxes and a piece of skull (in the east side of the grave). Because of these three pieces we assumed that the grave had been disturbed. In the central zone we found a vertebra, and in the east area there were fewer bones, none of them in anatomical connection. We found connected feet bones and also teeth (these were all over the grave), long bones on the layer of the 0.45 / 0.55 m depth. Under this level skull and rib fragments appeared. Because of this fact we can state that the grave had been disturbed at a certain moment. No bones were found on the same layer, in the east side of the grave, but in the west area we did, most of them in the northern half, apparently in anatomical connection, 2 humeri and ribs. 30 cm. south of these bones we found 2 vertebrae in anatomical connection. The skull fragment that we collected had worn teeth with a cavity. w e think this grave contains only one individual, and the skeleton had been disturbed at a certain moment while some of the bones were still in anatomical connection (we found parts of the skeleton naturally connected). The bones had been moved in the north-west side of the grave. In the east half of the grave we found few small bones only. The grave had been repaired with clay and small stones after its construction because, in the east half, the rock had cracked too much and had a hole (Plate 8 / 1, 2). The clay and rocks had been used to bring the bottom of the grave at the same level before the burial. Niche dimensions (width): 0.14 m.
G7 (Plate 8/ 4) : 20 m. west of G6 we started to excavate another grave (with patura). At a 0.40 m. depth, stones and shards (small pieces very hard to identify) of Byzantine pottery were found. On the bottom of the grave, in the central zone, we found skull pieces. Because of this we can say that at a certain moment the grave had been used for another purpose (we do not believe that this grave had been robbed; if it had been robbed the bones would have been moved throughout the grave – it is possible that this grave had been used as a water tank in modern times). All the graves on the island are dug in stone, and most of them had practical utility as they were used for multiple burials – containing two and even three individuals, which is attested by the archaeological discoveries; if the graves had been dug in the ground, the multiple burials would have been very difficult. Currently we believe that these were family groups that controlled a certain area where they had their homes and outbuildings and where they buried their dead. For the 5 th – 7 th centuries such burials with several individuals in one grave are quite frequent (Nalpadis 2002, p. 537 - 537). Once the grave is dug and the first burial done, the grave is temporarily covered with stone slabs. When necessary, the slabs would be removed for the next burial. When they eventually believe there is no room left for other burials, they would put the stone slabs in place and seal the grave with mortar (Plate 9/ 1 - 3). As to the discovered wine presses, we believe that they were jointly used by a family group. The analysis of the bones in the graves can clarify whether they were individuals of the same family. 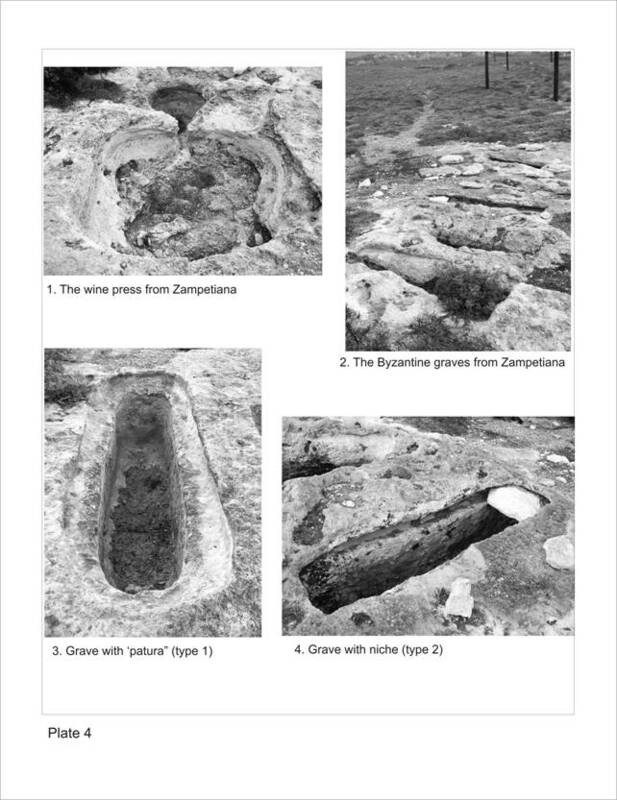 The analysis of the bones in each little necropolis can also clarify for us whether there were villages founded by a family / clan. As regards the discovered items, we refer here to the cross-shaped buckle, which type is encountered north of the Black Sea. We must detect where the item comes from and thus determine the economic connections of the island’s inhabitants. The same must be done for the earrings (according to the analogy we found, they come from the mainland, probably by route of the Kythira island). The analysis of the metals the two objects are made of will hopefully clarify things for us. It is very important to find out whether the inhabitants of the island in the Byzantine period were religiously dependent on Crete or Kythira (now the island is under the Metropolitan Church of Kythira). Although the presence of the cross-shaped buckle and the east-west orientation of the graves are indicative of the fact that the population was Christian, until the discovery of a potential basilica of the 5 th – 7 th centuries we are in doubt as to the religion of the locals. We must keep in mind that in the 4 th century Greece is represented by only 3 bishops in the Niceea Council, that only one Christian basilica, the one in Epidauros, has been dated (Frantz 1965, p. 188) back to the same century, which is why the existence of a 5 th – 7 th century basilica on the island is highly unlikely. Plutarch, Pompei, in Vieti paralele, translated by N.I. Barbu, Bucharest, 1969. Atlante I 1981: - Enciclopedia Dell’Arte Antica Classica e Orientale, Altante delle forme ceramiche I. Ceramica fine romana nel bacino mediterraneo (medio e tardo impero), Roma, 1981. Hayes 1972: HAYES (J. W.). – Late Roman Pottery, London, 1972. Marrou 1999: Marrou (H-I). – Biserica in antichitatea tarzie (303 - 604), translated by R. Mares, Teora, 1999. Peacock & Williams 1986: PEACOCK (D.P.S.) & WILLIAMS (D.F.). – Amphorae and Roman Economy, Longman 1986. Robinson 1959: ROBINSON (H). – Pottery of the Roman Period, in THE ATHENIAN AGORA V, New Jersey, 1959. Nalpandis 2002: Nalpandis (D). - Cemeteries, burials and burial practice, in Everyday Life in Byzantium, edited by Demetra Papanikola-Bakirtzi, Athens, 2002, p. 535-537. Papanikola-Bakirtzi 2002: Papanikola-Bakirtzi (D). – Dress and Toilette, in Everyday Life in Byzantium, edited by Demetra Papanikola-Bakirtzi, Athens, 2002, p. 378-473. Dennis 2001: DENNIS (G. T.). – Death in Byzantium, in Dumbarton Oaks Papers (55), 2001, p. 1-7. Frantz 1965: FRANTZ (A). – From Paganism to Christianity in Athens, in Dumbarton Oaks Papers (XIX), 1965, p. 187-205. Travlos, Frantz 1965: TRAVLOS (J), FRANTZ (A), The Church of St. Dionysios the Areopagite and the Palace of the Archbishop of Athens in the 16 th century, in Hesperia 34 (1965), p. 157-202. Velkovska 2001: VELKOVSKA (E). - Funeral Rites according to the Byzantine Liturgical Sources, in Dumbarton Oaks Papers (55), 2001, p. 21-45.